AJ Hurt, shown racing at the 2017 Xfinity Killington Cup last year, sits in first place in the Nor-Am Cup overall standings. Through a handful of alpine events in the North American Cup series, Squaw Valley’s AJ Hurt, 18, leads the field of skiers, sitting in first place in the overall standings. Hurt swept the Nor-Am events at Lake Louise, Alberta to open the season, winning a pair of downhill events and super-G.
Hurt then traveled to Panorama, British Columbia, and continued her terrific start to the season with wins in alpine combined and super-G.
Hurt’s run of first-place finishes ended on Dec. 10, when she didn’t finish her first run during a super-G event at Panorama. Another skier who grew up racing for Squaw Valley Ski Team, Nina O’Brien, picked up her first cup win of the season at the event, outdueling a pair of American skiers by 0.01 to take the victory in super-G.
Hurt bounced back with wins in alpine combined and super-G the following day, while O’Brien took fourth in super-G. O’Brien found the top of the podium again on Dec. 12, edging out Hurt, who finished in second, by nearly half a second. Hurt closed out 2018 with a ninth in giant slalom, and a 16th and 11th in slalom. 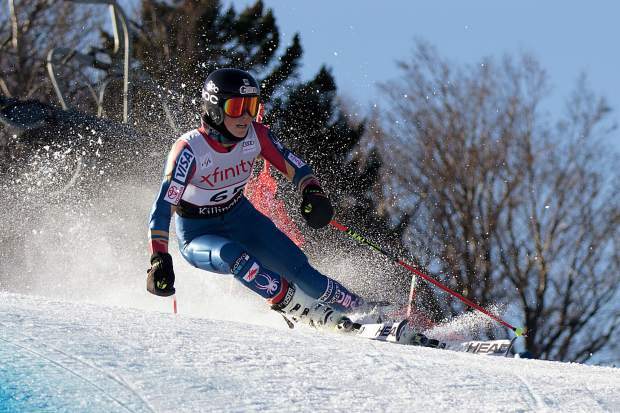 O’Brien finished racing at Panorama with a seventh in giant slalom and a second-place finish in slalom. Hurt currently leads the field of racers with 648 points overall. She’s also the top-ranked skier in downhill and combined. Patricia Manga, 21, of Buffalo, New York, is second with 493 points. O’Brien is third with 446 points, and is the top-ranked skier in super-G.
Another of Squaw Valley Ski Team racers, Keely Cashman, 19, of Strawberry, has been consistent all season long. Cashman has placed in the top eight in six of her eight races this year. Her best results of the season have been third-place finishes in slalom at Panorama and in downhill at Lake Louise. Cashman is currently fifth in the overall standings with 354 points. Also in alpine racing, Sugar Bowl Ski Team & Academy’s Preston O’Brien raced to a fourth-place finish in the Western Region Open Series giant slalom at Snow King Mountain Resort in Jackson, Wyoming, on Dec. 17. O’Brien, 17, also finished fifth in slalom while at Snow King. Reno-Tahoe area athletes climbed the podium last week at the 2018 Dew Tour in Breckenridge, Colorado. Truckee’s Toby Miller, 18, took third place in men’s snowboarding superpipe, finishing the competition with a score of 84.33. Another athlete with Truckee ties, Danny Davis, finished sixth with 75.67 points. Australia’s Scotty James won the event with a score of 93.33. On the women’s side, Olympic gold medalist Chloe Kim, 18, took first-place with a score of 94.67 points. Another Mammoth Mountain rider, Maddie Mastro, was second with 88.00 points. In women’s snowboarding slopestyle, South Lake Tahoe’s Jamie Anderson took fourth with 167.99 points. Austria’s Anna Gasser won the event with a score of 177.67. In skiing superpipe, Reno’s David Wise, 28, finished third with a score of 84.67. Alexander Ferreira won gold with a score of 90.00. Alpine Meadows product, Brita Sigourney was fourth on the women’s side with 68.33 points, topping Mammoth Lakes’ Abigale Hansen, who finished fifth with 67.33 points. South Lake Tahoe’s Maddie Bowman was seventh with 56.00 points. Truckee’s Hannah Halvorsen, 20, is off to a solid start in cross-country skiing with a pair of top-five finishes on the North American Cup and US Super Tour. Halvorsen skied to a third-place finish in the 1.3-kilometer sprint in Yellowstone to open the season. She then traveled to Vernon, British Columbia, and finished fifth in the sprint in the Nor-Am Cup opener on Dec. 8. The Alaska Pacific University Nordic athlete took eighth the following day in the 10-kilometer classic race. Due to snow conditions in the race arena, Far West Skiing announced the pair of night slalom races at Auburn Ski Club scheduled for Dec. 29-30 have been moved to Jan. 18-19. For more information, visit FWSkiing.org. The United States of America Snowboard and Freeski Association North Tahoe Series opener is scheduled for Saturday morning, Dec. 22 at Boreal Mountain Resort. The series will open with a rail jam, beginning at 11 a.m. Registration for the event closes on Thursday, Dec. 20 at 11 p.m. For more information or to register, visit NorthTahoeSeries.com.